In this 4th post of a series, I’d like to imagine how the first translator of the 23rd Psalm rendered the Hebrew into Hellene. I’d like you to imagine with me the context. The empire of Alexander the Great is established. 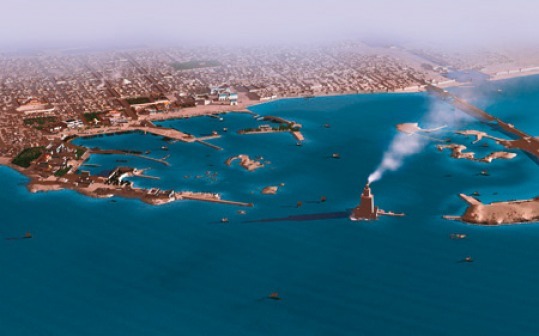 The King of Egypt is helping to make Alexandria the greatest and most cosmopolitan city of the conquered world. Imagine the setting, the beauty of the coastal scenery, the bustle of the port. See how it’s a light to the world. Now, imagine the specter of the military. As welcoming as the victors are, there’s a shadow of death. The city wasn’t surrendered easily. And the cultures clashed. Who the real barbarians were was renegotiated, redefined. But in many ways it was as it always had been, and would continue to be. Somebody gave the orders, and somebody else obeyed. And at one point in the history of this place came the order from Somebody to have all books, all the libraries in foreign tongues, brought into the civilized language, the language of the world, the language of Alexander, the Great Greek language. And the Jews, some of them back in Egypt, were ordered to translate their sacred and holy and high Hebrew scriptures. To make them accessible to Greek readers, to the Nations. One Greek speaking Jew, a citizen of Alexandria all of his life, said: Anathema! And this meant ἀνάθεμα!! And yet the legends tell us that, despite any protest to the contrary, in that City, the translators, as if making bricks with straw they had to gather themselves, complied. Faithfully they translated, so the stories go. And to this day, Albert Pietersma who has studied their Greek translation talks of it being a literal translation, a consistent one. These Jewish translators were no Greek language hacks. But then Pietersma notices something else. Did the Greeks and the Egyptians notice? Did they read Hebrew? How would they know? There are spins of interpretation, and sparks of the literary. Did the Greeks and the Egyptians notice? Well? Didn’t they know the plays performed? Didn’t they study Aristotle? Thanks to Alexander, and to Theophrastus. Didn’t they remember Homer, and regard Plato? Well, yes. So who’s reading this translation? Or should we call it, would they know? Should we call it instead a rendering? A rendering can be a bringing across of meanings. A rendering can also be a rending, a tearing. So let’s try to imagine together the 23rd Psalm in a place where there were few shepherds and many sailors, where there was strong drink, and many soldiers, where there was slavery, and many intellectuals, where there were gods and goddesses and stronger Greek gods and goddesses, but there was a Jewish Master, one God for a few. Who would speak the Name aloud? Who would translate all that was said and sung? So maybe the Greeks and the Egyptians and the Jews, coexisting more or less at least in the markets, would have read the same text the same way. And yet. And yet, perhaps the translator, the renderer of High Holy Hebrew into Official Hellene left something for his fellows, for the insiders, that the outsiders didn’t always get. A mixture, yes, interpretive spin on the Hebrew, yes, a literary Hellene spark here and there, a mixing, a rendering. Naught to me is lacking. For you, there with me, are. Those who would enslave me. a drunken drunk drink, of stout. Into those farthest away days. You have filed this correctly under fun.